Inhalation is the primary route by which the general population might be exposed to asbestos. Small quantities of asbestos fibres are common in air, arising from natural sources (weathering of asbestos-containing materials), windblown soil from hazardous waste sites, deterioration of automobile clutches and brakes, or breakdown of asbestos-containing materials. The levels of asbestos in dust and windblown soil may be higher if you live close to where asbestos and certain other ores are mined or processed, where a building that contains asbestos products is demolished down or renovated, or a waste site where asbestos is not properly covered. Asbestos is primarily controlled by the Health and Safety in Employment (Asbestos) Regulations 1998 administered by the Ministry of Business, Innovation and Employment. The Building Act 2004, and the New Zealand Building Code clause F2 Hazardous Building Materials, control the use of asbestos in buildings. The Act is administered by your local authority. As asbestos-containing materials are now generally unavailable, the use of asbestos is not often an issue in new buildings. If asbestos-containing materials are used in new buildings, they must be sealed or encapsulated with a suitable coating, or bonded in a matrix, to comply with the Building Code. You should get advice about this from your local authority (city or district council). The highest risk of exposure to asbestos in the home is through home renovating, by cutting or drilling through asbestos-cement sheeting or sanding down asbestos-containing lino or tiles. Left undisturbed, such materials pose little risk, therefore it is recommended that asbestos-containing material in good condition be left alone. 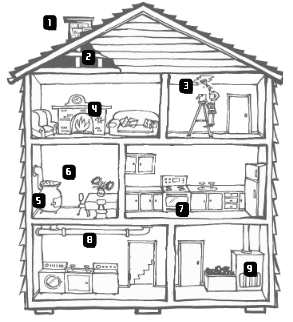 Exposure levels indoors depends on asbestos type and its condition. Constant exposure to crumbly or powdery (friable), damaged, exposed, or poorly maintained asbestos materials may increase the health risk. Generally, asbestos-containing materials that are in good condition will not release asbestos fibres. There is no danger unless fibres are released and inhaled into lungs. The risk from exposure to asbestos in the non-occupational setting is considered to be low since the concentrations of asbestos fibres are low. the degree of damage or wear. Testing a sample in an approved analytical laboratory is the only way to find out if a material contains asbestos. If you need to get a sample tested, contact HazMat, they only use accredited laboratories and approved sample procedures. Asbestos-containing material on decorative ceilings, walls or flooring is not likely to be a health risk unless it is damaged, deteriorating or crumbly. If the material is poorly bonded, damaged or deteriorating, fibres may be released into the air. This material should be sealed, encapsulated, enclosed or removed. Sealing is done by applying paint to the surface. When hardened this stops the release of loose asbestos dust. Encapsulation is when asbestos-containing-material is coated with a material that soaks through the asbestos-containing-material and hardens, stopping the release of loose asbestos fibres. Enclosing is when a construction is placed around the asbestos-containing-material (like a false wall) to contain the asbestos. Contact HazMat for an onsite consultation if unsure. Asbestos may be present in textured paint and in patching compounds on wall and ceiling joints. Artificial ashes and embers sold for use in old gas-fired fireplaces may contain asbestos. Asbestos is found in some vinyl floor tiles and as backing on vinyl sheet flooring and adhesives. Contact a health protection officer at your local district health board (DHB) if you think you might have asbestos in your home. They will advise you. External cladding (including roof tiles made of asbestos) should not cause any concern if not damaged. Even if the cladding is deteriorating, the Ministry of Health advises that the cladding should be sealed rather than removed or replaced. The process of removal will disturb the asbestos, releasing high-risk concentrations of fibres into the air, endangering the health of everyone in the locality. If left in place, the amount of fibres released is not considered to be a health risk. However, if you have asbestos-containing roofing, be aware that the ceiling space under the roof may have high concentrations of asbestos dust, particularly if the roofing is weathered and brittle. The use of an approved commercial sealant may stop the release of fibres. Both water-based (emulsion) coatings and solvent-based coatings may be used. They can be pigmented or clear. Not all paint and surface coatings are suitable. Some may increase fire risks, so you should consult the paint manufacturer to find out more about the suitability of the product. The Ministry of Health strongly advises that you use WorkSafe NZ-certified contractors to remove asbestos-containing-materials as exposure to asbestos fibres is a danger to health. Necessary precautions and good work practices are well known to experienced specialist firms. They will also be better equipped to handle asbestos. A list of people who are currently certified to remove asbestos from commercial and domestic premises can be found on the WorkSafe website. HazMat are Class A certified to remove asbestos and will be found on the worksafe website.